I was a helicopter pilot in the military, and whenever rotary wing and fixed wing aviators got together, a spirited discussion as to which was the safest to fly was bound to ensue. The helicopter, it was argued, would drop like the proverbial rock from the sky when power was lost, and an airplane could glide to a safe landing. But, the helicopter only needed a small patch of land on which to make a safe emergency landing while an airplane needed hundreds of yards of clearing in which to land safely. Likewise, when multihull and monohull sailors gather, it’s inevitable the question of safety will be brought up. In fact, the argument is not unique to sailing and aviation. The more skilled or more well informed debater may seem to win any given argument but, actually, there is little, if any, hard evidence to prove the argument one way or the other. In the end, it comes down to personal preference, and safety depends on many variables, not the least of which is luck. That said, the debates will undoubtedly continue, and, in the spirit of encouraging lively discussion, this month I am going to take a look at Corsair Marine’s F-24 trimaran. 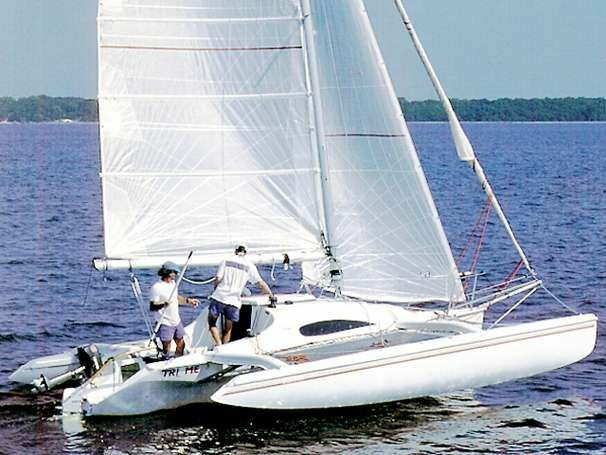 Corsair Marine was started in Chula Vista, CA, in 1986, to build and market the 27--a trimaran design of New Zealand native Ian Farrier. Farrier, who had previously established a reputation for successful multi-hull design in Australia, had developed and patented a unique mechanism for his new design that allowed the amas (outer hulls) to be folded for trailering or docking at a normal width slip. The F-27 was nearly an immediate success, and on the heels of that success, the F-24 was introduced in 1991. Weight is generally more critical to the performance of multihull vessels than monohulls, and to best control weight, construction of the F-24 utilizes state-of-the-art composite techniques with foam sandwich construction used in hulls, decks, and other molded parts. In addition, double-bias glass fabrics, carbon fiber, or Kevlar unidirectional materials are selectively used in high stress areas. The hulls and parts are vacuum-bagged to better control the fiberglass-to-resin ratio and ultimately the strength-to-weight ratio of the boat. All this results in a stiff, strong, and light boat but comes at a price. The overall length is 24’ and the maximum beam is 17’ 11". There is a large cockpit and the typical trampoline-like webbing between the main hull and the amas, resulting in loads of useable space topside. Below decks is a different story though. The main hull, which is the only habitable space below decks, is only slightly over 6’ 6" wide at its maximum, and the cockpit takes up nearly one third its overall length. Below there is a v-berth forward which in the manufacturer’s drawings shows two pillows but is much too small for two adults. The port-a-poti is under the v-berth. Along the starboard side of the cabin is a settee that converts to a double berth but in doing so takes up the entire cabin width. With limited clearance above the settee, once extended to a berth, the only way to get about the cabin is to crawl on hands and knees. There is a decent little galley along the port side with sink, single burner stove, and ice box. The companionway hatch opens to allow full standing headroom at the after end of the main cabin next to the galley sink. A canvas boom-tent could be rigged at anchor to keep this area protected and open in inclement weather. It seems clear that speed and sailing performance, not accommodations, were the priorities of this design. When it’s time to go sailing, the fun starts. Regrettably, I have not had a chance to sail the F-24 although I have sailed her big sister, the F-27, and I can assure you the performance is exhilarating and sometimes a little scary. An acquaintance, who has sailed the F-24 reports similar performance. He reports boat speeds while close reaching commonly exceeding true wind speed, quick response, easy tacks, and generally good behavior. With the board down the F-24 points quite well but, as is the case with most multihulls, she is more efficient cracked off a little. In general, multihull boats are a good deal more expensive to build per foot than monohulls. Throw in the F-24’s complicated engineering necessary for the folding amas and the price goes even higher. So, you get the picture; these are expensive boats. For further information, you may wish to contact the F-24 class association at 4652 Tulane Drive, Baton Rouge, LA 70808, or visit the manufacturer’s web site which also has a link to boats offered for sale. In my opinion, the F-24 is not recommended for an inexperienced or a timid sailor. This is clearly a performance-oriented trimaran, and at speeds approaching 20 knots, which this boat is capable of, things happen fast, and the consequences of mistakes can be magnified. Even the manufacturer warns that although sailors have made offshore passages with these boats, it is not advisable. For those that are willing to pay the price and endure the minimal accommodations, the F-24 does offers some very distinct advantages such as trailerability, docking at normal width slips, exceptional speed and performance, and very solid construction.